This is the first story of Larua as a 4-year old in a log cabin in the woods of Wisconsin. I’ve never read any of these books before, and honestly I can’t even say whether I ever watched the TV show. So I didn’t know quite what to expect. Whatever I expected, this wasn’t it. This book is written with a slice-of-life narrative with no plot and very little dialog – it was kind of a passive story…or perhaps a string of memories/anecdotes that are connected in approximate chronological order. Not that I’m saying I disliked it. It was really cute and a really quick read. I’m definitely going to continue with the rest of them. I’m also not entirely sure why this is considered a Christmas book. Yes, Christmas was included in the time-line, but it was about an entire year living in the little log cabin in the woods. I think the cutest part of the book was when Laura and her mother went out to milk the cow at night and mistook a bear for the cow. 🙂 Laura’s corn-cob doll was also pretty adorable. I think it’s interesting how many people care about whether this story was truly factual. I mean, of course it’s not fully factual – apparently Laura was younger when she lived on the Prairie than when she lived in the woods in Wisconsin, but she switched the timeline around. I’m sure some of the memories she mentions are also not fully factual, but that’s how family anecdotes are – they change with time and audience. This isn’t an autobiography, this is a string of anecdotes for children. Such a sweet series and the Tv series was something I watched out for! I have a huge sentimental attachment to these books since they were some of my favorites from my childhood. The writing style does become a bit more detailed as the series goes on. It grows a bit as Laura does. They are a fictionalized account of her life and I always knew that. I am not sure why some people get so worked up about it. I still go back and read them occasionally. I just read them again when my daughter was reading them. I never liked the tv show at all. It doesn't stick to the books and I am a traditionalist. Don't mess with the story I am familiar with! I loved this entire series as a child. As an adult, I think that this one is the weakest of the entire series. My favorites have become The Shores of Silver Lake, because it shows Laura at her most free, as well as The Long Winter, which illustrates the resilience of spirit and community focus of the townspeople. Are you reading the entire series? 🙂 I probably should try it out after reading the books, though I heard it doesn't follow very well. Some people get worked up when they discover a book they thought was nonfiction turns out to be fiction. They feel cheated of reality, I guess. I made the mistake of letting my mom know that Anna and the King was extremely fictionalized. She hadn't known that it was supposed to be non-fiction, but when I told her she just stopped reading the book altogether! Yes, with the Little House Readalong. I definitely need to try at least one! I hadn't read it before or watched the TV series, but I enjoyed it. It is strange at first how it sort of has no plot, but I guess it reminded me of Little Women slightly (although that was published a lot earlier) in as much as it being just things that happened in their lives, and that's among my favourite books so no bad thing. I also find it interesting that some people seem to be hung up on how factual they are. Because they're her life story people expect that every single thing will have happened but obviously that's no necessarily the case. I think all families probably contain a healthy dose of stories that nobody's sure actually did happen – it just makes it more fun! I'm really looking forward to the next one! I hear the later ones are a little better, though they're such quick reads you might as well just get the whole story, in my eyes. I haven't actually read Little Women yet, though maybe I'll try to squeeze it in this month with the readalong that's going on over at It's All About Books. I've gotta leave time to finish the ARCs I'm reading too, though. 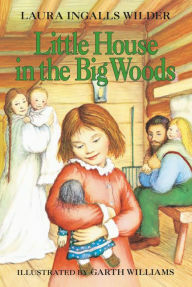 Though I love this series, Little House in the Big Woods is not my favorite. They do get better as they go along! My favorites are Farmer Boy, The Long Winter, and by On the Banks of Plum Creek! 🙂 I loved the earlier years of television series growing up and as a young woman, but did not care for it as much as it went on. Yeah, I'm excited to get farther along in the series where things get a little more involved. Yeah, I'm really enjoying the readalong so far!